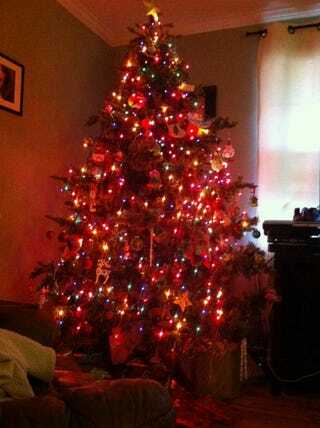 This is my huge tacky Christmas tree! I lurve it with all of my multi-colored heart. It speaks to me just like slice and bake sugar cookies and dollar store glittered stockings do. Imma make myself a big mug of microwave hot chocolate and watch "A Christmas Vacation" while Dolly's Hard Candy Christmas plays in the background. Happy Saturday, everyone!